My Father was a poor kid from Bridgeport, Connecticut, an industrial town 62 miles north of New York City. He spoke fondly of his childhood despite the hardships. He wanted more than life in Bridgeport could give him so at 17 he hitchhiked to California and enlisted in the United States Navy. He served during the last two years of World War II and was a signal man on the USS Anacostia, an oil tanker that had the dangerous task of replenishing fuel to ships in combat zones (pictured above) After 20 years of service he retired a Master Chief Petty Officer at Great Lakes Naval Station in North Chicago. The Master Chief Petty Officer of the Navy (MCPON) is the senior enlisted person in the Navy. It carries requirements of time in service, superior evaluation scores and selection by a board of master chiefs. Petty officers possess a rate also known as a rank and a rating for their specialty. His was Journalism. In fact, he was the first Journalism Officer Master Chief (JOCM) in naval history. He was better at the mechanics of words than mechanical engineering. His military career took him around the world. He tutored prisoners in English and math at the Portsmouth Naval Prison a former U.S. Navy and Marine Corps prison on the grounds of the Portsmouth Naval Shipyard in Kittery, Maine. He was a journalist and editor of several naval news publications. He greeted dignitaries as part of the Public Information Office and covered events on the naval base in Naples, Italy where we was stationed for several years. In the final years of his military career at Great Lakes he worked a second job and attended Northwestern University at night. He was hired out of the classroom upon retiring from the Navy and entered the public sector at 38 with a wife and four kids in tow—all born on bases around the world. Discipline: You’ve got to show up and give it your all 100 percent of the time… And he did. He was one of the hardest working people I know. Respect: There are all walks of life in the military and in the world. 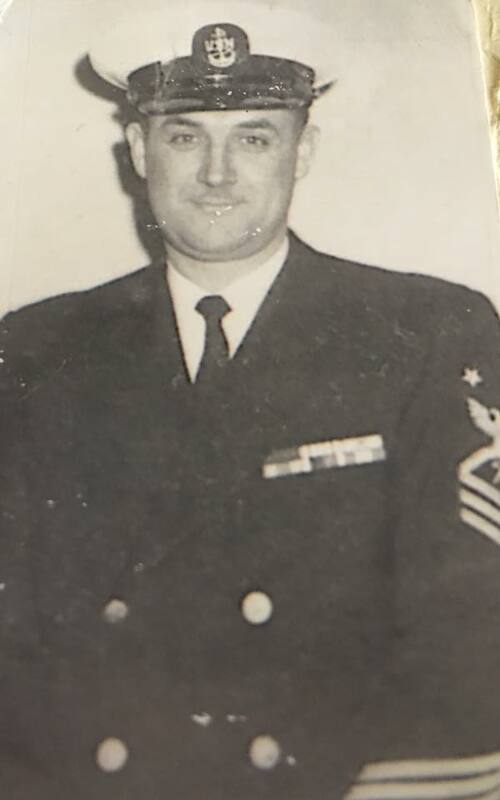 He was naturally curious and treated everyone with respect and that served him well throughout his naval career and years in the private sector. Diplomacy: While he was spirited with the Irish glimmer in his eye, he had great diplomacy which I am sure was cultivated while moving up the ranks during his military career. Not everyone is cut from the same cloth. He was accepting of all people regardless of race or rank and was gifted at communicating with anyone. Leadership: A military career helps you learn to take orders and then ultimately give them as you advance. You cannot lead if you cannot direct and he did it well. Pride: He loved America. He wasn't afraid of hard work and he approached every day with passion and pride. And he appreciated all that America has to offer. Thank you to all of our Veterans as we observe Veterans Day. I am proud of all that you have given back to America and personally thankful for how my Dad's military service helped cultivated a person of character.